What Paul spoke of is something extremely important, yet many Christians either do not understand what he speaks of, or simply decide to ignore it. Through modern revelation, Members of the Church of Jesus Christ of Latter-day Saints know that Paul is speaking of the Three Degrees of Glory that are found in the Plan of Salvation. 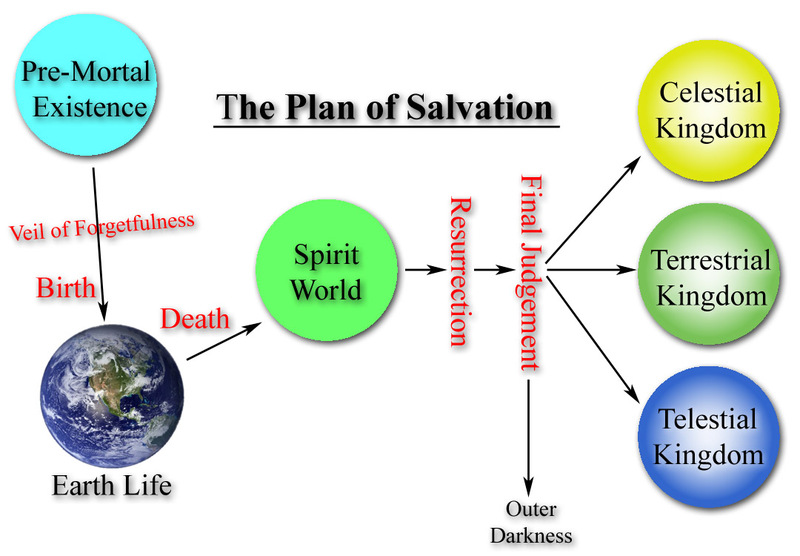 So, what is the Plan of Salvation? It is a plan that God has given to us, to understand the deepest questions of our soul; Where did we come from? Why are we here? and Where are we going after death? In my scriptures I have a small piece of paper inserted into my Bible that outlines this plan. It is there to help me remember the sacred love that God has for us all! Before the world was created, we all lived with God! We are His offspring, however we lacked one major thing that God possessed, and that was knowledge and experience. While we will never EVER become God, we can however strive to be LIKE Him! God (Our Heavenly Father) wants us to become like Him and because of this He created a world for us to live and dwell, that we might learn and grow from our trials and tribulations. The Book of Genesis recounts the story of the Creation; where God created not only the world, but also created man to dwell on the earth. He provided our first parents (Adam and Eve) to make their own choices in the Garden of Eden, disobeying Father meant that they were cast out of the Garden. Men “fell” from the presence of God, and as a consequence would have to work by the “…sweat of thy face shalt thou eat bread…” (Genesis 3:19) Mankind would now have to work and learn by themselves, without the presence of God directly in their lives. Mankind would have to walk by faith and not by sight. 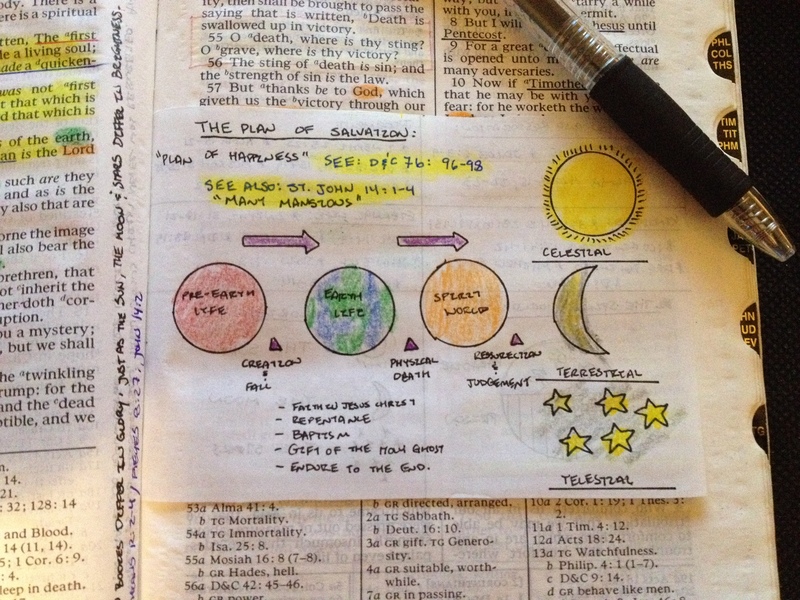 The Book of Mormon helps us to understand more of the Plan of Salvation. Yes, Adam and Eve did disobey a commandment of God. They partook of the Fruit of Knowledge of Good and Evil, in defiance of God’s word. However, God being all knowing, knew that they would disobey. He set in motion a savior for them [for all mankind] that we might be able to choose good from evil. When Christ came to the earth, He died for our sins and with His grace we can all be saved. Salvation is a FREE gift! Accepting it however is our own choice! With acceptance of this FREE gift, we are asked to live by God’s commandments and become a Disciple of Christ! What does Disciple mean? Disciple comes from the same root word as “Discipline”, therefore disciples are disciplined in the commandments of God and walk in the footsteps of Jesus Christ! It is not enough to just say you accept Christ into your life. You must constantly prove those words to be true, through your actions! If we chose to follow Jesus Christ, we must through personal revelation come to a knowledge of Him and have Faith in him. We must repent of our sins and be baptized as he was baptized. After baptism we must also receive the Gift of the Holy Ghost by the Power and Authority of the Priesthood. Upon completing these steps, we must then live our lives in accordance to the covenant and promises we made at baptism. We must follow His commandments and live as He would live. Then and only then can we return to live with our Father in Heaven and be “…caught up into paradise…” (2 Corinthians 12:4) as Paul had spoken. Finally, we ask “where are we going after death”? The Gospel of Jesus Christ through modern revelation has revealed the answers to these questions. We all know that we will die, and when we die we will go to a Spirit World where we will wait for the Day of Judgment. Those who were faithful to the Lord will wait in a state of Paradise and those who were not faithful or did not have the opportunity to learn about Christ during their earth life will have an opportunity to be taught and accept the Gospel on the other side. When Jesus Christ finally comes for a Second time, all men and women will be judged according to their works, merits, and intents of their heart. Upon the completion of this Judgment, each person will receive their glory according to the guidelines mentioned. This is where Paul speaks of “Three Heavens”. This is the Glory of the Sun, Moon and Stars. We too must remember that God has a plan for each one of us; the Plan of Salvation helps us to understand the most basic questions of life’s supposedly “unanswered” questions. The truth of the matter is this… God speak today, He has authorized servants speaking on His behalf! We are not alone, nor has God abandoned us! We need to remember that God is GOOD, and He knows what’s best for us… if we are faced with difficulties, we need to remember that with weakness, vulnerability, in infirmities and in trials… comes STRENGTH! This entry was posted in 2 Corinthians, New Testament and tagged 3, 3 Degrees of Glory, Christ, Degrees of Glory, God, Heaven, Heavenly Father, Jesus, Jesus Christ, Multiple Heavens, Paradise, plan, Plan of Salvation, Spirit World, Strength, Third Heaven, Three, weakness. Bookmark the permalink.